The domain within your query sequence starts at position 1189 and ends at position 1559; the E-value for the RasGAP domain shown below is 2.56e-151. All alpha-helical domain that accelerates the GTPase activity of Ras, thereby "switching" it into an "off" position. Improved domain limits from structure. 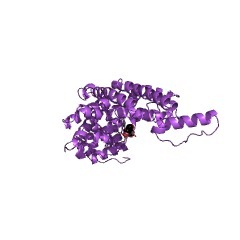 This entry represents a conserved domain in the RasGAPs (Ras GTPase-activating proteins). This domain is also known as the RasGAP domain. 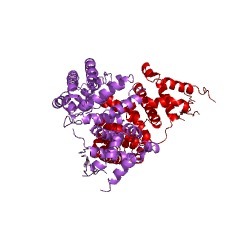 Ras proteins are membrane-associated molecular switches that bind GTP and GDP and slowly hydrolyze GTP to GDP [(PUBMED:1898771)]. 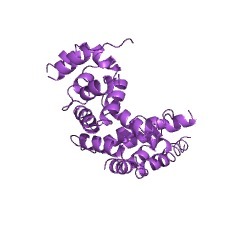 This intrinsic GTPase activity of Ras is regulated by a family of proteins collectively known as 'GAP' or GTPase-activating proteins [(PUBMED:1883874), (PUBMED:7945277)]. 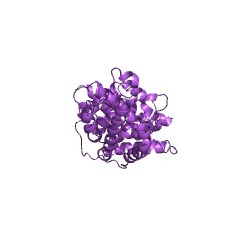 RasGAP proteins are usually quite large (from 765 residues for sar1 to 3079 residues for IRA2) but share only a limited (about 250 residues) region of sequence similarity, referred to as the 'catalytic domain' or RasGAP domain. The most conserved region within this domain contains a 15 residue motif which seems to be characteristic of this family of proteins [(PUBMED:1883874)]. Note: There are distinctly different GAPs for the rap and rho/rac subfamilies of Ras-like proteins (reviewed in reference [(PUBMED:8259209)]) that do not share sequence similarity with ras GAPs. There are 8958 RasGAP domains in 8955 proteins in SMART's nrdb database. Taxonomic distribution of proteins containing RasGAP domain. This tree includes only several representative species. The complete taxonomic breakdown of all proteins with RasGAP domain is also avaliable. Click on the protein counts, or double click on taxonomic names to display all proteins containing RasGAP domain in the selected taxonomic class. Structure of the guanine nucleotide exchange factor Sec7 domain of human arno and analysis of the interaction with ARF GTPase. Sec7-related guanine nucleotide exchange factors (GEFs) initiate vesicle budding from the Golgi membrane surface by converting the GTPase ARF to a GTP-bound, membrane-associated form. 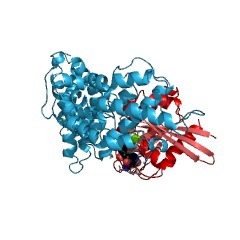 Here we report the crystal structure of the catalytic Sec7 homology domain of Arno, a human GEF for ARF1, determined at 2.2 angstroms resolution. The Sec7 domain is an elongated, all-helical protein with a distinctive hydrophobic groove that is phylogenetically conserved. Structure-based mutagenesis identifies the groove and an adjacent conserved loop as the ARF-interacting surface. The sites of Sec7 domain interaction on ARF1 have subsequently been mapped, by protein footprinting experiments, to the switch 1 and switch 2 GTPase regions, leading to a model for the interaction between ARF GTPases and Sec7 domain exchange factors. The importance of two conserved arginine residues for catalysis by the ras GTPase-activating protein, neurofibromin. 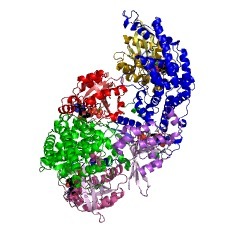 Ras proteins are guanine-nucleotide binding proteins that have a low intrinsic GTPase activity that is enhanced 10(5)-fold by the GTPase-activating proteins (GAPs) p120-GAP and neurofibromin. Comparison of the primary sequences of RasGAPs shows two invariant arginine residues (Arg1276 and Arg1391 of neurofibromin). In this study, site-directed mutagenesis was used to change each of these residues in the catalytic domain of neurofibromin (NF1-334) to alanine. The ability of the mutant proteins to bind to Ras.GTP and to stimulate their intrinsic GTPase rate was then determined by kinetic methods under single turnover conditions using a fluorescent analogue of GTP. The separate contributions of each of these residues to catalysis and binding affinity to Ras were measured. Both the R1276A and the R1391A mutant NF1-334 proteins were 1000-fold less active than wild-type NF1-334 in activating the GTPase when measured at saturating concentrations. In contrast, there was only a minor effect of either mutation on NF1-334 affinity for wild-type Ha-Ras. These data are consistent with both arginines being required for efficient catalysis. Neither arginine is absolutely essential, because the mutant NF1-334 proteins increase the intrinsic Ras.GTPase by at least 100-fold. The roles of Arg1276 and Arg1391 in neurofibromin are consistent with proposals based on the recently published x-ray structure of p120-GAP complexed with Ras. The interaction of Ras with GTPase-activating proteins. Ras plays a major role as a molecular switch in many signal transduction pathways which lead to cell growth and differentiation. The GTPase reaction of Ras is of central importance in the function of the switch since it terminates Ras-effector interactions. GTPase-activating proteins (GAPs) accelerate the very slow intrinsic hydrolysis reaction of the GTP-bound Ras by several orders of magnitude and thereby act as presumably negative regulators of Ras action. The GTP hydrolysis of oncogenic mutants of Ras remains unaltered. In this review we discuss recent biochemical and structural findings relating to the mechanism of GAP action, which strengthen the hypothesis that GAP accelerates the actual cleavage step by stabilizing the transition state of the phosphoryl transfer reaction. SwissProt sequences and OMIM curated human diseases associated with missense mutations within the RasGAP domain. This information is based on mapping of SMART genomic protein database to KEGG orthologous groups. Percentage points are related to the number of proteins with RasGAP domain which could be assigned to a KEGG orthologous group, and not all proteins containing RasGAP domain. Please note that proteins can be included in multiple pathways, ie. the numbers above will not always add up to 100%.